I have a birthday in mid-December, and we usually go away then to beat the peak rates and influx of holidaymakers at Christmas. This year we took a 5-day weekend and spent it travelling to and from Albany and Esperance in Western Australia, staying overnight in Albany on the Friday and Monday, and in Esperance on the Saturday and Sunday. 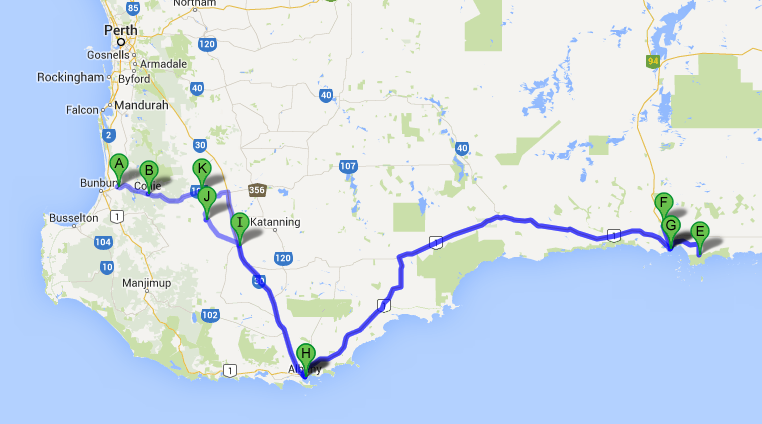 It’s a long drive — about 4 hours to Albany and another 5 hours to Esperance from Albany, and then back again. Friday 13 December: We left home about 11:30 am. It was already pretty hot and was only going to get hotter. We headed east to Collie where we stopped briefly to eat the sandwiches I’d made earlier that day. Then we travelled even further east to hit Albany highway at Arthur River. There we turned right and continued south to the southern ocean at Albany. The drive was uneventful and took about 4 hours. Saw very little wildlife — no doubt it was too hot for them too. Almost all the fields had been harvested and there were a lot of grain trucks on the road carrying the best grain harvest the state has had in many years. We arrived in Albany late in the afternoon and checked into our accommodation at the Dog Rock Motel. Free wifi! though the connection in the room we were in (Room 15) was a bit flaky. It was almost 5 pm, so there was no time for shopping so we just chilled out in the air conditioning until we were due at Rustlers Steakhouse in Albany. We’ve eaten at Rustlers several times before and it was a great meal as always, but I think I overdid it ;-). We started with a shared serving of six Jalapeno Poppers, followed by our steaks. 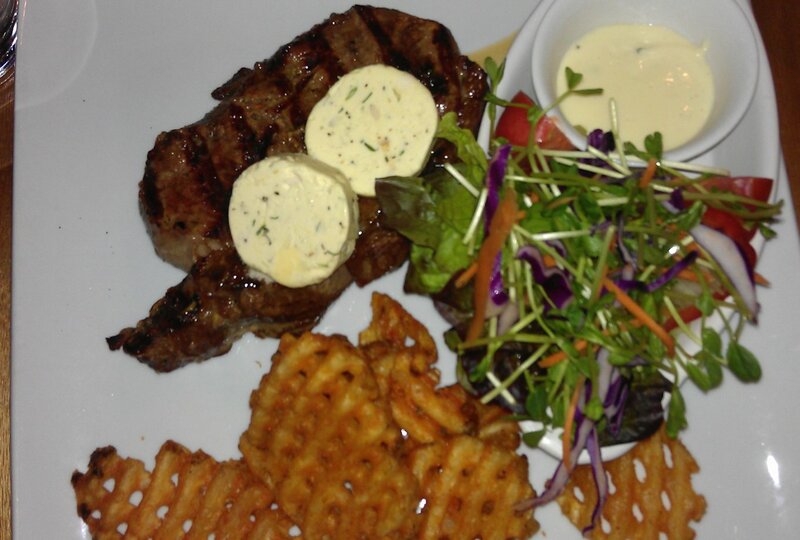 I had the rib eye (though there was no bone this time) with blue cheese butter. It was a big steak — about 400 grams! My DH had the prime fillet. Both came with a garden salad and fries or baked potato. And then my DH ordered TWO desserts for us to share. We rarely have dessert so this was a bit over the top. We had the very tart lemon meringue and the mango and passionfruit tart, both with cream, raspberry coulis and rum and raisin icecream. 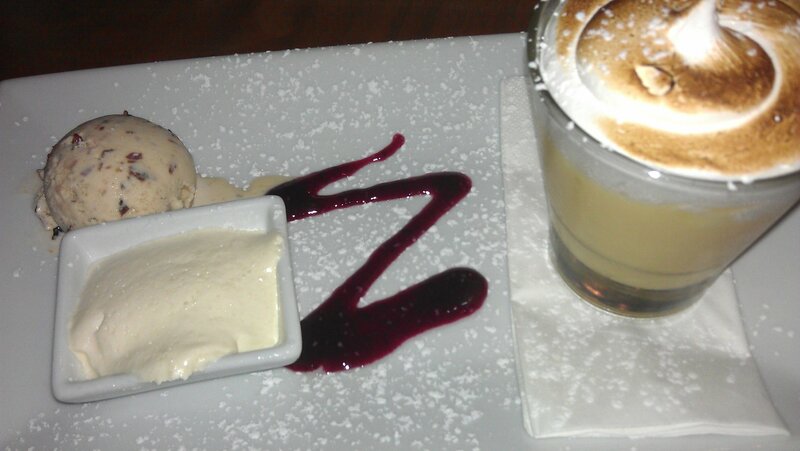 In my opinion, the icecream didn’t go very well with the lemon meringue… Too many flavours. I don’t know what it was in that mix or just the mix itself but I didn’t feel very good for the rest of the evening. I think it was just the combination and sheer quantity of rich food that made me feel very uncomfortable afterwards. I didn’t sleep very well though my DH had no problem. Saturday 14 December: I must’ve eventually slept OK as I didn’t wake until almost 8 am next day. Breakfast was out of the question after last night’s huge meal! We did a bit of shopping in Albany (to get my DH an update to his wardrobe — we were in and out of the clothing store in 15 minutes and he came away with three new shirts, two pairs of shorts, and new socks… and that 15 minutes included him trying them on!). Then we hit the road for Esperance around 9:30am. Another uneventful drive. It was a super hot day, so thank goodness for car air conditioning. We stopped at the roadhouse at Jerramungup and got a brilliant ham and salad roll for lunch from there — super fresh, big crusty roll, tasty, filled with decent sizes of all sorts of goodies. We arrived in Esperance about 5 hours after leaving Albany (some 480 km away). The sea breeze was in, thank goodness, but it was still hot. Checked into our motel and crashed. This time my DH wasn’t feeling well and ended up sleeping for about 3 hours. I wasn’t surprised as he’d driven both days and it’s a long drive with lots of road trains to be aware of. And he hadn’t had his usual coffee either day. 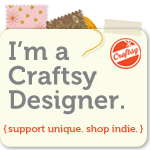 Sunday December 15: We slept more than 12 hours! It was very hot today in Esperance. Expected to be 36C or higher (I think it got to 40C). We were on the road just before 9 am heading west to the Esperance reproduction of Stonehenge, of all places! I was surprised how much I was impressed by it. 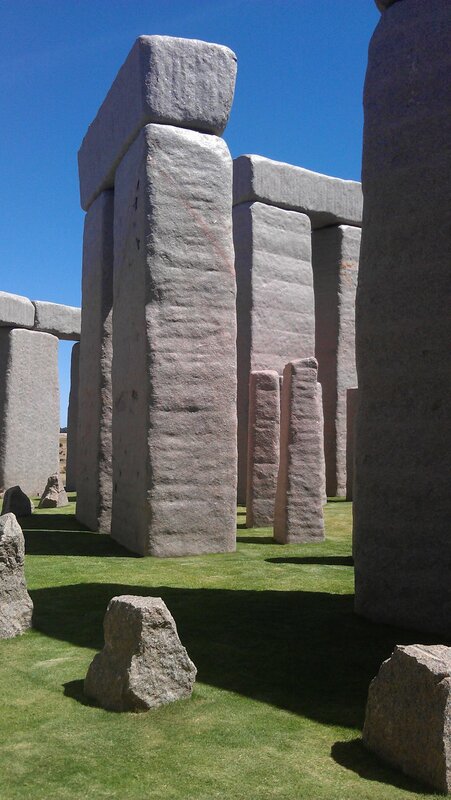 It was pretty spectacular, with some 2500 tonnes of pink granite used to create an exact replica of the real Stonehenge as it would have been in 1950 BC. It’s well worth the side trip if ever you’re in Esperance (it’s about 20 km out of town on a ridge overlooking the Great Southern Ocean), but I wouldn’t drive to Esperance JUST to see it. Admission: $10 per person; $8 for concession card holders. Next stop east was Cape Le Grand National Park and the famous Lucky Bay. There were no kangaroos on the beach this time, probably because there were quite a few people on the beach and in the water (Lucky Bay is known for its turquoise water, glaring white sand — and kangaroos that come to the beach). The flies were super friendly…. We also went to Le Grand Beach though we didn’t swim as we didn’t have our bathers with us. It was hot enough though (usually the air and water temperature at Esperance is too cold for swimming… but not this weekend!). There were heaps of Western Australian Christmas Trees (Nuytsia floribunda) in the national park, and throughout all the areas we travelled. It was good to see them as they are rapidly disappearing from the metro area and south-west as housing developments take over. They are a parasitic tree and only flower for a few weeks a year — but when they do flower, they are just spectacular — really deep orange gold flowers against a dark green background; they are almost a ‘poster child’ for the Australian sporting colours of green and gold. Next was the Pink Lake which wasn’t pink today at all! 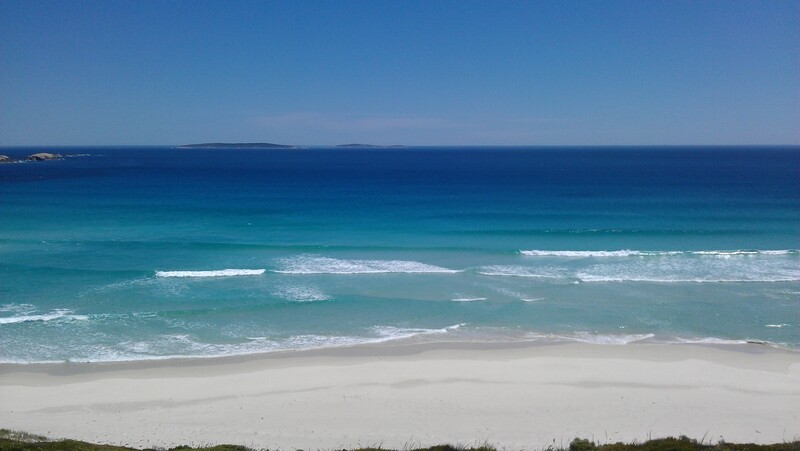 Then the gorgeous drive along the coast near Esperance, stopping at various bays and beaches to take photos of the impossibly turquoise water and white sandy beaches. It was still really hot, so after our drive around the Esperance area it was back to air-conditioned comfort of our motel room. DH still wasn’t feeling good, so he slept away the rest of the afternoon while I read. Dinner this evening was at the motel’s restaurant ‘Seasons’. I had the fish of the day – a big piece of groper, and my DH had the sirloin steak. We also had the chilli cheese loaf for entree but despite it looking fantastic it didn’t taste much of anything – almost no cheese or chilli flavour and the bread was quite sweet and a bit stodgy. It was disappointing considering how great it looked. 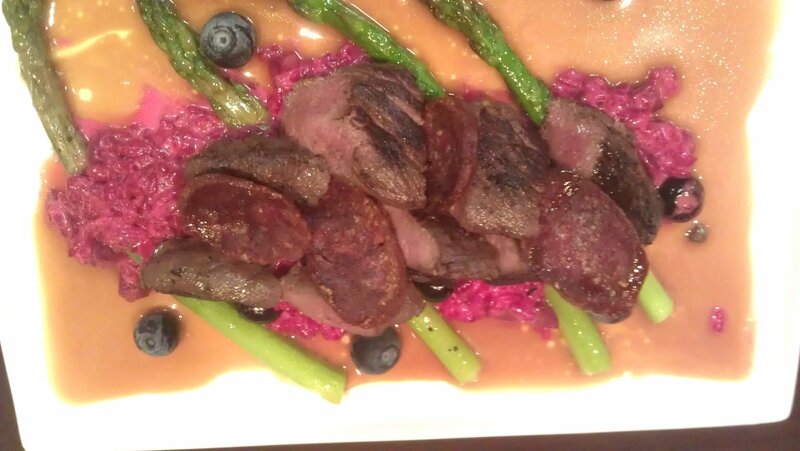 My fish was good though, and my DH said his steak was excellent. Monday 16 December: It was expected to be 40 in Esperance again today, so we were on the road back to Albany by 8:30 am. Albany’s maximum was expected to be about 25 which sounded pretty good to me! Called in briefly to a quilt shop in Ravensthorpe that someone I know owns, but she had gone to Esperance for the day and her daughter was minding the store. Also stopped at Jerramungup again for one of their great ham and salad rolls. We got into Albany around 2 pm and checked back in to the Dog Rock Motel. We had a much nicer room this time (for future reference, it was in the 40 block — I’d asked for a better room for Wifi reception when we stayed overnight on Friday; the new room seemed to be a bigger room and the Wifi was much more stable and strong). Tuesday December 17. We headed back home today. It was much cooler for driving when we left Albany, but was already pretty hot by the time we got to Mt Barker, only 50 km away. Instead of heading back exactly the way we came, we took the road from near Kojonup that cut across to Darkan. I’d never been on that road before (that I can recall), but my Mum lived in that area as a small child, so it was interesting to see how far out in the boonies her family lived and what sort of countryside she lived in. From Darkan, it was back to the Bunbury area via Collie, and home. It was a lovely break — and good to get my eyes focusing on stuff in the far distance instead of close up with computer screens.